21H+ 10n = 31H + 6257.426 KeV. E2 = E2H3 =6257.426 KeV. E3 = E2H3 =16699.28 KeV. E1sum= E1=4449.749 KeV – for the first step. E2sum= E1+E2=4449.749 KeV +6257.426 KeV=10706.924 KeV – for the second step. E3sum= E1+E2+E3=4449.749 KeV +6257.426 KeV+16699.28 KeV=27406.204 KeV -for the third step. According to table № T-3.2 we shall construct the schedule № G-3.1 describing the allocation of energy E in steps and total allocation of energy Esum. 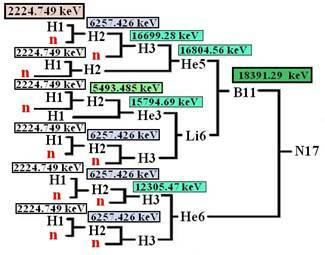 And total allocation of energy Esum, at synthesis of a kernel of helium 52He. After construction of the schedule we move to the analysis of the received data and the schedule. In this analysis a full chain of synthesis is made, considering all the nuclide and calculated allocation of energy for all kernels. And so, the program of the analysis is certain, we move to the following stage. 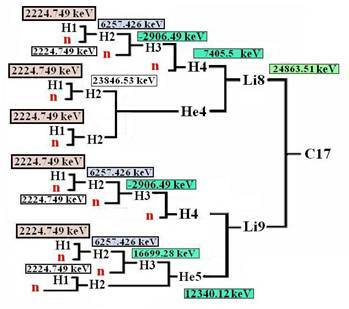 Let’s choose chains of synthesis from protons and neutrons up to the heaviest kernels limited by the periodic table with Z=110, A=272 and Z=111, A=272. The chain was chosen by the rate of its maximal length and by the presence of data in table № A-1, for elements of this chain. The chosen chain of synthesis (11H – a kernel with Z=111, A=272), for two kernels, is represented on schemes № S-3.2, № S-3.3, № S-3.4. Chains of synthesis (11H – a kernel with Z=111, A=272): for three kernels – on schemes № S-3.7, № S-3.8; for four kernels – № S-3.9; for ten kernels – № S-3.10. Chains of synthesis (11H – a kernel with Z=110, A=272) for two kernels are represented on schemes № S-3.5, № S-3.6. Variant – (11H – a kernel with Z=111, A=272) on schemes № S-3.2, № S-3.3, № S-3.4. (18) Table № T-3.3, a line 16. (20) Table № T-3.3, a line 15.